As the darkness was gathering over Kwaio Mountain, the locals made their way from their thatched roof huts for the Pig Roast and the nights ceremonies. 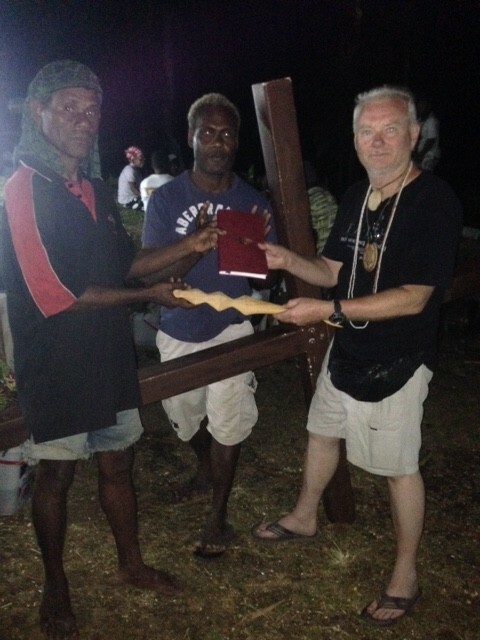 From the door of my hut I watched in stunned silence as a whole village came out to honor the Cross and the white man that had made such an effort to come up the mountain to share with them. In my wildest dreams I could never have imagined such a thing. Yes, I had talked and prayed with many and listened to their hearts. I had hugged and embraced some who had never seen a white man. I had stood under a tree with the chief for a long while and listened to his hopes and desires for his people. I had told him of friends in America and other places, that I knew and believed would be willing to bring or send help because of the Love the Lord had put in their hearts. I remember him looking in my eyes searching to see if I spoke true. At the end he shook my hand and with one long last look in my eyes, he thanked me…. Now, this night they are gathering to show their kindness, gratitude and their deep desire to honor this man with the Cross. For the evenings events, they had brought out the generator and strung lights, which they do not do much because gas has to be carried in and up that mountain. This was a sacrifice and I knew it. 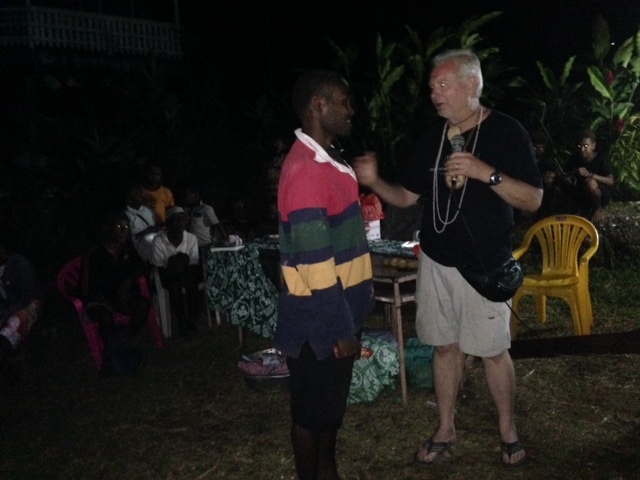 Then after everyone had gathered and where seated on mats or rocks and logs, they came and got me. At this point I still did not know totally what they were planning, all I knew was that we were going to be exchanging gifts. Then as I came out of my hut, the village applauded and shouted. I was definitely shocked and stunned at this display of love. With tears in my eyes they led me to a table that they had set up for me. They brought me a plate of taro root, cassava and a sweet potato. As we finished that, everything else began. Over the PA system powered by the generator, Robert welcomed and greeted everyone. With the few lights we had, I could barely see the crowd that faded out into the night but you could sure hear them. The next thing that happened blew me away!! The Chief came forward with his children and with Robert holding the microphone, the Chief thanked me for coming to Nanakinnimai, his village. “Thank you”, he said, “for bringing the Cross and showing so much concern for my people. That concern is the heart of a chief” and with that he put this beautiful 70 year old Chiefs medallion around my neck and made me a chief of the Kwaio people. 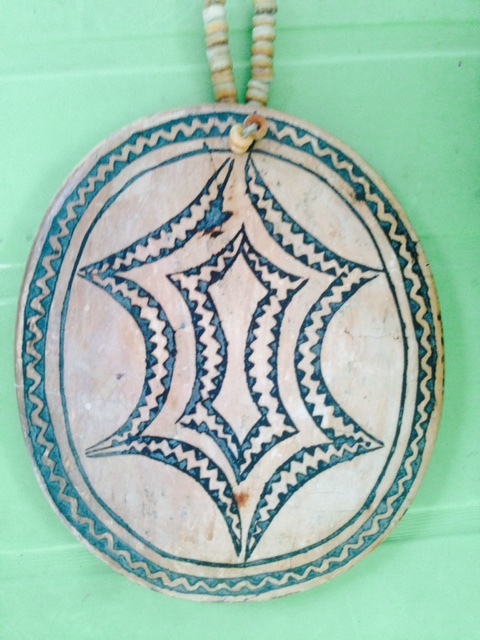 The medallion is solid stone sanded smooth with the symbol of the Kwaio people carved in it. (See the pic) Next his oldest daughter put around my neck another beautiful medallion, called the Queens medallion, for Doreen though she was not there. (I sure wish she could’ve been there with me as I know her heart beats the same as mine!) It is about 50 years old and a little smaller than mine. (You can see it on me in the pic) Then the next daughter down brought and hung around my neck a long strand of their shell money which is still valid in the Solomon’s today. Next, the Chief’s son brought his dad his War Club. 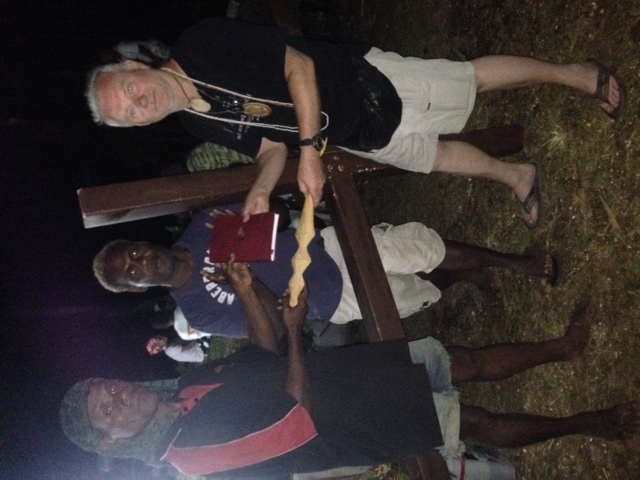 He then presented it to me and said, “I present this to you because I believe you will fight for my people. 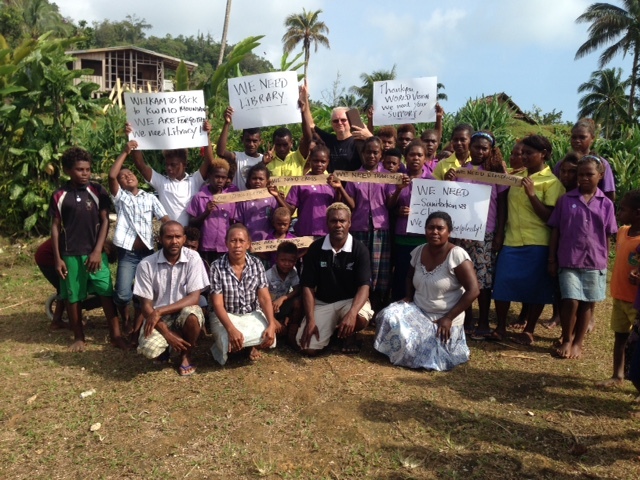 We need help, we need school supplies, medical supplies, electricity and more. I give you my club to fight for us”. I presented many other things to different people there that night but I think most of all I gave them my heart and they gave to me, theirs. The singing, dancing and festivities went on till 1Am. It truly was a beautiful night. I dropped into bed exhausted but laid there in wonder as I thought of all that day had held. Thank you Jesus!! © 2019 Rick Newton Cross Carrier - Evangelistic Ministries.